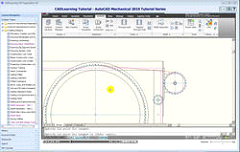 Our AutoCAD® Mechanical 210 Training DVD consists of over 120 video lessons, spanning over 8 hours on DVD and it also includes training for AutoCAD 2010. AutoCAD Mechanical is a design and drafting tool for manufacturing, and is used to accelerate the mechanical design process. Our AutoCAD Mechanical training dvd will show you how to work more efficiently and teach you to save hours of design time by automating common design tasks. Jim Swain, is a Solutions Engineer with Synergis Technologies in Pennsylvania. Prior to joining Synergis in 1997, he worked in the automotive and consumer electronics industries as a design engineer, and CAD administrator. Jim has over 25 years of CAD experience, including 15 years with AutoCAD.